OAKLAND — The night began with a ceremony for retiring Red Sox star David Ortiz. The A’s weren’t any less hospitable once Friday’s game started. The Red Sox, leading the majors in most every significant offensive category, steamrolled to a 16-2 rout to open a weekend series that marks Ortiz’s final games at the Coliseum. To honor the occasion, the A’s presented Ortiz a giant bottle of Cabernet Sauvignon in a pregame presentation that included manager Bob Melvin and president Michael Crowley. Then Big Papi proceeded to drive in three runs over his first four plate appearances. Travis Shaw hit a three-run homer and had five RBI as the majors’ top-scoring team notched a season high for runs by an A’s opponent. In an omen of how things would go for the A’s, they lost starter Andrew Triggs after just one inning due to back tightness. That’s par for the course in a year where they’ve burned through 12 starting pitchers, but Triggs had represented a silver lining with solid work since shifting over from the bullpen. Boston, which pulled to within one game of first-place Toronto in the American League East, broke through with a four-run fifth off Zach Neal to break a 2-2 tie, then wiped out all hints of suspense with six more runs in the sixth, highlighted by Shaw’s three-run blast off J.B. Wendelken. Though the outcome was decided early, the late innings held some intrigue with the major league debut of Red Sox infielder Yoan Moncada, the 21-year-old generally considered the major leagues’ best prospect. Moncada took over third base in the bottom of the seventh and showed a strong arm on a backhand play to throw out Chad Pinder. He got a hearty ovation from the large contingent of Boston fans in attendance for his first plate appearance in the eighth, when he drew a five-pitch walk. Triggs entered the night with a 2.92 ERA in his five starts and earned his first career victory in his previous start at St. Louis. He gave up a run on Ortiz’s single in the first and had thrown just 24 pitches when he was replaced by Neal after the first. There was no immediate word on the severity of Triggs’ injury. Neal was charged with five runs (four earned) over his 3 2/3 innings. Daniel Coulombe and Wendelken also got tagged for four earned runs each. The task of mounting a comeback wasn’t going to be easy against Sox lefty David Price, who has found his form of late. The A’s did erase an early 2-0 deficit to tie the game in the fourth. 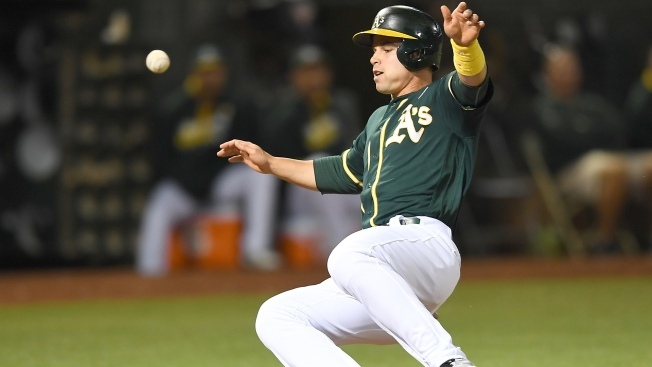 Jake Smolinski and Danny Valencia singled to lead off the inning, then Smolinski tagged and advanced on Khris Davis’ foul out and scored on Billy Butler’s sacrifice fly. Stephen Vogt doubled to the right field corner to score Valencia from first. But the A’s collected just four hits in seven innings off Price (14-8), who has won each of his past five starts. The A’s were shaky early with two errors that led to two unearned runs. Marcus Semien bounced a throw that Valencia couldn’t scoop in the first inning and was charged with a two-base error on Xander Bogaerts’ grounder. Bogaert's would score on Ortiz’s single to center. In the third, Dustin Pedroia’s single to right short-hopped and ricocheted away from Eibner, which sent Pedroia to second. He scored on Mookie Betts’ sacrifice fly. The annouNced crowd was 21,376. Daniel Mengden (1-5, 5.73) will make his first major league start since July 25 in Saturday’s 6:05 p.m. game. He draws a tough assignment in opposing Rick Porcello (18-3, 3.26).